There was a storm again last night. That’s not unusual…but waking to a light dusting of snow on the mountains was certainly different. It’s going to get down to 32 degrees tonight! What did Beth say the temp in Hemet was again? 100 degrees? I dropped off a few more photos for the folks at the Grant-Kohrs Ranch. Bill was in regular Park Ranger clothes today. He said, “I really enjoyed getting to know you folks” and wondered if we would “mind exchanging E-mail addresses ?” It’s nice to make friends as we go along on our journey. We explored Helena today. It’s got a lot of history. At one time it had the most millionaires for its size of anywhere in the United States. 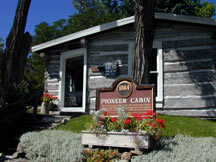 There are some grand old mansions…and some wonderful little pioneer cabins. We visited one that I loved. There weren’t ropes or glass between you and the old things. 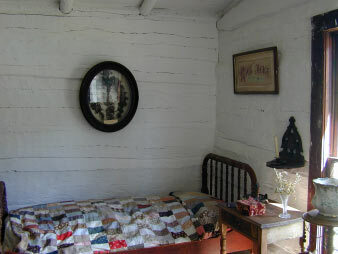 In fact they curator invited us to sit down in the old chairs while she told us the story of the place. It wasn’t hard to imagine what it was like living there. One of the unusual things about the cabin is the size of the window. Most windows were very tiny in those times, because of the cost to have them transported from the East.